« An Organised Gang Drove Off With My House of Commons!! Once Lambeth had about 1200 of these properties, houses in such bad state of repair that they were given to people on the housing list at no or low rents to do up themselves. Today they have about 170 left. Some residents have been in these “short life” houses for 30 or 40 years and are now in their 60s and 70s. 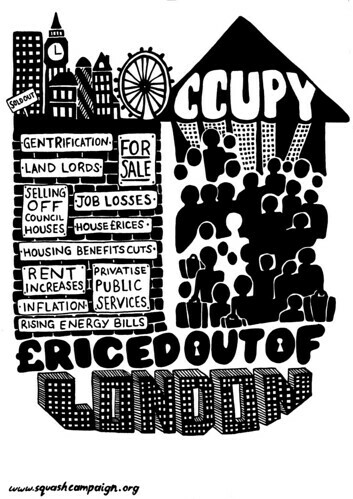 Many are run by housing co-operatives a number of whom have now grouped together in a “super-co-op” to campaign against the sell off and propose an alternative co-operative solution under the name Lambeth United Housing Co-Op). But this is no block to council selling these houses off to the private market and destroying the co-ops, and with them well established communities. The residents have often spent thousands of pounds putting in new windows, central heating and on general repairs. They were given to them precisely because at the time the councils wouldn’t spend the money on them. Last July a small group of cabinet members decided to push ahead and terminate all short life properties, revoking the licences and putting them on the market. Since then there have been a series of court cases with the Council trying to evict or harass people to leave. Private Eye reckons that at least £175,000 has been spent paying the legal firm Devonshire’s bills so far. Lambeth council rejected offers from social landlords to take over these properties. A local Co-op Ekarro offered to pay 25-27% of value to keep them in social ownership – it was refused. For a long time Lambeth claimed it was negotiating a deal with Notting Hill Housing Association and needed the tenants to leave to achieve it. It soon became clear this housing association turned property developer was going to sell off 80% to the private market keeping only 20% for social housing! This deal fell through as well. So with its eyes on £32 million worth of property Lambeth turned to the private market itself, entering a hugely expensive process paying off a series of corporate vultures. When a property is vacated the Council pays to make it uninhabitable to “stop squatting”. Later, it pays a multinational Camelot to go in and make it habitable again for its “Guardians”, people often in desperate housing need who live in the property. The council then pays a fee of anything up to £100 a week for Camelot “protecting” the property. The Guardians, who have no tenant rights, live in the property paying Camelot a deposit of £500-600 and paying a “rent” of up to £65 a week. Little wonder this Netherlands based multinational had a turnover of £20 million in 2011. The council then has to pay auction houses like Andrews and Robertson fees to sell properties at an average of 30-40% below market prices. A recent 10-bedroom house in The Chase in Clapham, cleared of short life tenants, was sold for £1.6 million. At the same time a much smaller house in the same street was being marketed for £2.6 million. Lambeth Council argues that all evicted “short life” tenants will be offered priority on Choice Based Lettings in council housing. But this misses the point – the members of these co-ops do not want to move and see their communities destroyed. Neither do they want to take someone else’s place on the council waiting lists because Lambeth is selling off publicly owned housing into the private sector without replacing it. Lambeth already has 25,000 on its waiting lists and only 25,000 councils properties – by selling its housing it is just contributing to London’s housing crisis. The co-op members are not going quietly. They are fighting the council in the courts, where in a series of shambolic appearances by council lawyers, things have moved very slowly. The Co-ops have the support of local MP Kate Hoey, who even forced an adjournment debate in the House of Commons on the issue last December. With evictions now starting and property going under the hammer at auction protests must be stepped up locally. Lambeth SOS is supporting all short-life tenants and Co-op members who want to fight.